Many supporters of gun rights question why a single incident would cause the fervor and fallout that the Sandy Hook Massacre is causing. They argue, both on the national stage and on internet fora that Sandy Hook, while very tragic was not really that big of a deal, that it represented only a very small percentage of deaths per year by firearms. They look at Sandy Hook as an isolated incident and not as the last domino to fall in a line of murders that caused a tipping point in society’s zeitgeist. People no longer felt safe in public places…their malls, churches, workplaces, theaters and their children’s schools were no longer the safe havens of the past. As the discussions of gun regulations continue, and as people polarize to opposite sides of the conversation it pays to look back and see what events have happened in the past that similarly triggered national outrage, triggered a series of laws, regulations and continuing efforts to solve a problem on the national stage. Twenty five years ago, May 14, 1988 a former school bus, now owned by the First Assembly of God in Radcliff, Kentucky was heading home, southbound on Interstate 71 from Kings Island Amusement Park. It had 63 children and four adults aboard. Driving on the wrong side of the interstate, directly toward the bus was a single drunk driver in a Toyota Hi-Lux pickup truck…his blood alcohol level was .24. He hit the bus head-on pushing the front suspension of the bus into the just filled 60 gallon gasoline tank. The bus, legal and of standard design for the era had two exits…the front and back doors. The accident rendered the front door inoperable leaving everyone to get out by the back door…in a fire. The aftermath, 27 people – three adults and 24 children – were trapped aboard the burning bus and died. Thirty four escaped with burns and smoke inhalation. What can be learned from this horrific crash and what effects of this crash are applicable to Sandy Hook? The deaths were determined to be due to all 67 passengers trying to get out of one rear door. They were hampered by a roaring fire triggered by a non-protected gasoline tank, outside of the frame of the bus. The fire was exacerbated by the flammability and toxicity of the seating material, building a 2000 degree, toxic conflagration that killed or injured 61 of 67 passengers. And the trigger, that final domino…a drunk driver. The Carrollton Bus Crash became a national story that was in the national news for weeks. The outrage that this could happen was a tipping point for the fight against drunk driving. Mother’s Against Drunk Driving says Kentucky has made great strides. “In 1988 44% of crashes were alcohol involved and in 2006 which is the latest 20.4% where alcohol was involved” said Angela Criswell in 2008. Kentucky now has the second lowest rate nationwide for drunk driving fatalities. Kentucky lowered its blood alcohol threshold to .08, now the national standard. MADD, founded in 1980 found its membership growing and its influence increased after Carrollton. 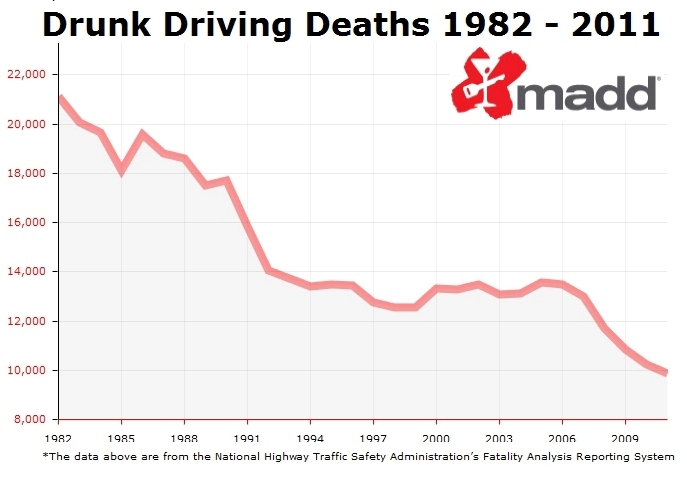 MADD and states began to change the way they responded to drunk drivers, adding over 1,400 new laws to impact drunk driving and its effects, and the results are that the number of deaths by drunk driver dropped dramatically from 1988’s 18,611 deaths to 2011’s 9,878. Liability for serving alcohol to people who have had too much is now the responsibility of bar and restaurant owners, bartenders and servers. Further, states began to look at technology such as the ignition interlock system to stop those who had previously been charged with drunk driving by not allowing their cars to start if they didn’t pass the interlock’s breath test. That technology is slowly making its way into manufacturers throughout the world. Besides the intense focus on drunk drivers, standards for buses were changed. Gas tank protection was improved and most buses now use diesel fuel, which is much less flammable than gasoline. Flammable and toxic materials in seats were changed and the seats themselves redesigned. Exits were increased from the normal TWO in 1988 to up to NINE now with reflective arrows pointing to those exits. The lesson learned, if society demands public safety, demands that their children be safe they will push for action. And they will push until they have solutions in place to begin to solve the problem. Do these solutions provide 100% success? Of course not. But each year that there are fewer than 10,000 people killed by drunk drivers instead of over 18,000, it is a success. May 14th of 2013 marks the 25th Anniversary of Carrollton. Media will again look back to see the impacts and changes for the survivors, the families of the dead, the school bus industry and the way society looks at drunk driving. And they will look back at the crash as well through a new documentary, Impact. After 1988 parents all across this country thought about Carrollton every time they put their children on a school bus. 25 years later parents all across the country think about Sandy Hook as they put their child on a bus or drop them off at school. Changes will happen. Society will push to better itself, to better the lives of its children. This entry was posted on Thursday, January 31st, 2013 at 5:59 am	and tagged with 2nd Amendment, AWB, firearms, gun, gun control, gun culture, gun violence, homicide. Carrollton Bus Crash, MADD, murder, NRA, Second Amendment and posted in Politics of Guns. You can follow any responses to this entry through the RSS 2.0 feed. An interesting post. Certainly something to consider.